KUALA LUMPUR, Malaysia (AP) — Tens of thousands of Malaysian Muslims rallied Saturday in Kuala Lumpur against any attempt to strip the ethnic Malay majority of its privileges, in the first massive street gathering since Prime Minister Mahathir Mohamad's alliance won a historic vote in May. The rally, backed by the country's two largest opposition Malay parties, was initially aimed at protesting a government plan to ratify a U.N. treaty against racial discrimination. Critics allege that ratifying the treaty would end Malay privileges under a decades-old affirmative action policy. The plan to ratify was eventually abandoned, but organizers decided to proceed with what they called a "thanksgiving" rally. Racial clashes have been rare in multiracial Malaysia since deadly riots in 1969. A year later, Malaysia instituted a preferential program that gives Malays privileges in jobs, education, contracts and housing to help narrow a wealth gap with the minority Chinese. Ethnic Malays account for nearly two-thirds of the country's 32 million people, with large Chinese and Indian minorities. Saturday's rally came less than two weeks after more than 80 people were arrested in a riot at an Indian temple in a suburb outside Kuala Lumpur. The government was quick to stress that the violence was due to a land dispute and was not a racial riot. Still, the government warned Saturday's rally-goers not to make any provocative statements that could fan racial tensions. Mahathir said the government allowed the rally as part of democracy, but warned against any chaos. The rally was held under tight police security, but ended peacefully after rain started to fall. Former Prime Minister Najib Razak, who has been charged with multiple counts of corruption, was among opposition lawmakers at the rally. Police said there were at least 55,000 people on the streets. Many wore white T-shirts and headbands with the words "Reject ICERD," referring to the U.N. treaty — the International Convention on the Elimination of All Forms of Racial Discrimination. The protesters gathered at three locations before marching to a nearby historic square, chanting "Long live the Malays" and "Crush ICERD." "Yes, we did not ratify ICERD, but we are still here to say that we are still against it," said shopkeeper Rosli Ikhsan. "Even if the government has said they won't endorse it, we are still protesting with all our might from all of Malaysia." Mahathir's new government won a stunning victory in a May 9 general election amid anger over a massive corruption scandal involving Najib and his government, but many Malays still support Najib's party, the United Malays National Organization, and the Malaysian Islamic Party, which controls two of the country's 13 states. Some analysts say Najib and his party were using the rally to shift attention away from corruption charges against Najib, his wife, his party's president and former government officials. 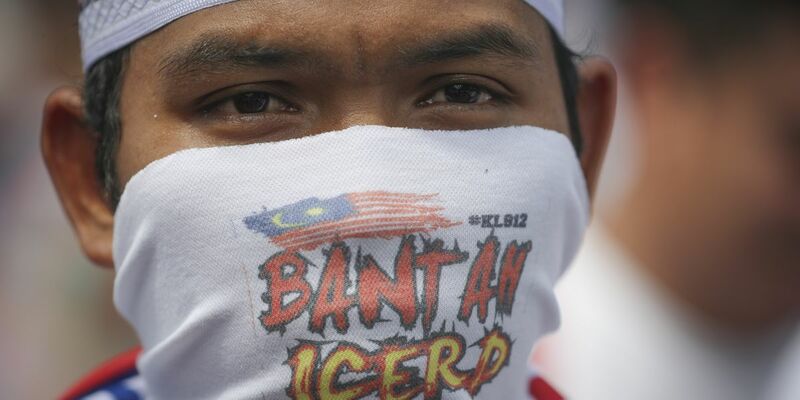 "For me, ICERD is bad," university student Nurul Qamariah said at the rally. "It's bad because it will erode the position of Malays. This is a country for Malays. We want Malays to be superiors, but why do these people want to make Malays the same level as Chinese and Indians?" Associated Press video journalist Syawalludin Zain contributed to this report.